Taxon of the Week has been delayed a day, as I wasn't actually at uni yesterday. But never fear - I know how much you've all been hanging out to see what the supreme organism will be this week, and this week's chosen organism is the turrid gastropod genus Comitas (image from here). 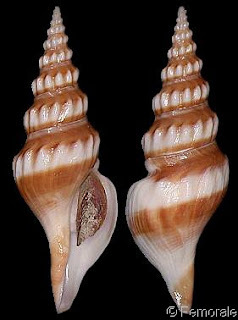 Turridae is a family of predatory gastropods, mostly fairly small though Comitas is one of the larger members, reaching up to 95 mm in length. The turrids belong to a clade called Toxoglossa that also includes the better-known Conidae (cone shells). The name Toxoglossa means "poison tongue", and a well-developed poison gland is associated with the radula of toxoglossans for the capture of prey. This has been taken to the greatest extent in cone shells, at least some of which are toxic enough to be dangerous to humans. Compared to other gastropods, toxoglossans show reduction in the numbers of radular teeth while individual teeth become larger and more elaborate (figure below from Kantor & Taylor, 2000). In cone shells, the individual teeth are long and spiral in cross-section to form a hypodermic toxin injector. Though there are far more species of Turridae in the world than Conidae, the latter receives a lot more attention than the former, probably because turrids are generally smaller, more retiring and more likely to be found in deeper waters. Comitas is found in deeper and cooler waters of the Indo-Pacific (Powell, 1966). Kantor, Y. I., & J. D. Taylor. 2000. Formation of marginal radular teeth in Conoidea (Neogastropoda) and the evolution of the hypodermic envenomation mechanism. Journal of Zoology 252: 251-262. Powell, A. W. B. 1966. The molluscan families Speightiidae and Turridae: An evaluation of the vaid taxa, both recent and fossil, with lists of characteristic species. Bulletin of the Auckland Institute and Museum 5: 1-184. What does a toxoglossan eat that it has to subdue with poison? A toxoglossan eats whatever it can catch and swallow whole - see this video of a cone shell eating a fish.